My involvement in developing a new rose garden has recently found me talking to rose growers, reading books about roses, browsing catalogues, and visiting rose gardens. Rose gardens have become démodé, seen as Edwardian relics that require lots of work and lots of chemicals to produce a too too brief exuberance, but I intend the rose garden we are developing to be sustainable and to give year-round interest. Choosing a few dozen varieties of rose to grow from the tens of thousands available is one of the most difficult parts of the process but I have the first definite rose on my list: the climber, Rosa banksiae. I was reminded to consider it when I saw it in full flower a few weeks ago growing in the walled vegetable garden at St-Jean-de-Beauregard, just south of Paris. As I was admiring it an imperious Franco-American woman told me I was wasting my time even looking at it. “Don’t think for one moment that you will be able to grow it. It’s far too tender and temperamental. I’ve tried in all my gardens and failed. And I’m no mean gardener.” Left hanging in the air was the suggestion that I would have no chance. She moved on, to bestow her wisdom upon someone else, before I had a chance to explain that I already grew a couple of forms of it. Many books suggest, like the stranger at St-Jean, that the rose is tender and needs mollycoddling. 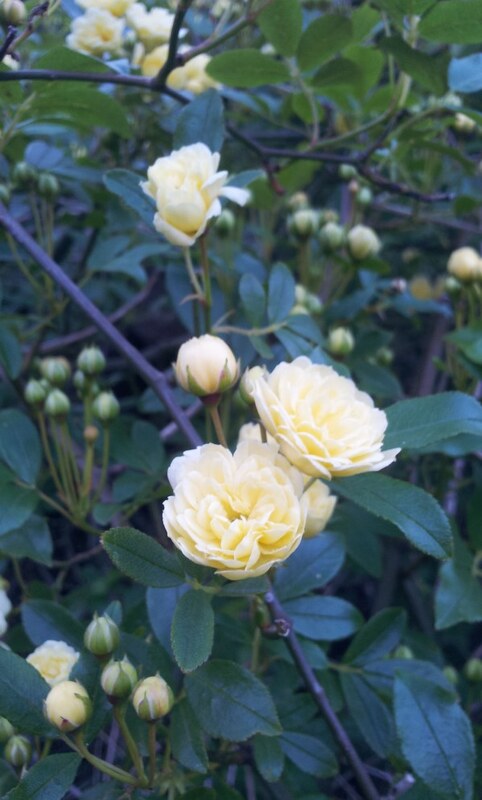 That has not been my experience, and last weekend, when I saw how well my Rosa banksiae ‘Lutea’, planted nearly twenty years ago, was flourishing, I realised it had to be on my list of roses for the new garden. 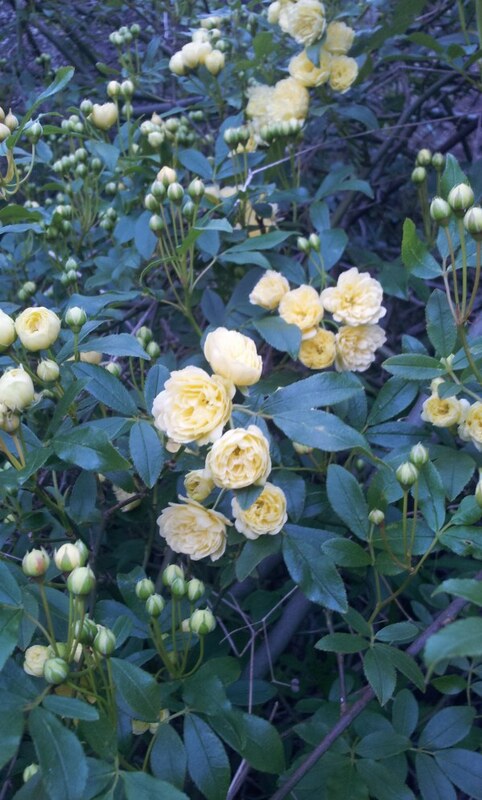 Growing on a west-facing wall in our garden in Les Nautes, SW France (at an altitude of 500m), it is about five metres wide and three metres high and smothered in small pale-yellow roses. For the past decade or so, running a nursery in Britain has prevented me from seeing it in flower and also, I am embarrassed to admit, from giving it any attention. It has not been fed, pruned, trained or in any way nurtured. And yet here it is in all its magnificence. True, it is a bit of a tangle and I promise that this autumn I will prune it back and give it some attention. But it certainly doesn’t need pampering. It is a vigorous rose with thornless stems (although you do get a few thorns on old woody stems). The flowers are small, about 2.5cm (1in) in diameter and grow in sprays. Although they are small there are always masses of them. In northern Europe they flower in early spring ‒ how early depends on the weather. 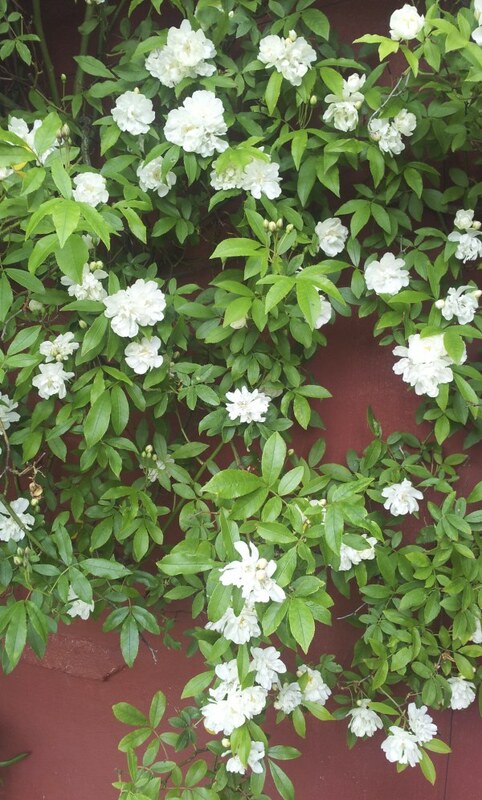 The flowers are produced on second year growth, so keep pruning to a minimum. In Hertfordshire we grow the white-flowered form, Rosa banksiae var. banksiae. It, too, grows on an exposed west-facing wall in shamefully poor soil. The next time I write about this rose I hope it will be prospering in the new rose garden. Sir Joseph Banks was a wealthy naturalist and patron of science. Joshua Reynolds’ portrait of him shows a handsome, earnest young man. In 1766, at the age of 23, he travelled to Newfoundland and described several dozen new species. Two years later he joined Captain Cook’s expedition on ‘The Endeavour’ to South America, Tahiti, New Zealand and, eventually, Australia. Banks funded other naturalists on the voyage, including the painter Sydney Parkinson. ‘Bank’s Florilegium’ consists of 800 paintings by Parkinson of plants described by Banks, and was finally published in its entirety in the 1980s. Banks also funded expeditions by explorers and botanists throughout the world. He sent the Scottish gardener William Kerr to China in 1804 and during the following eight years he sent several hundred specimens to his patron, including this rose. It grows in central and western at altitudes of 500–2,200 m (1,640–7,218 ft). The plant is named in honour not of Banks but of his wife and is sometimes known as the Lady Banks Rose.